Insightful review on the product review website, 10 TopTen Reviews. 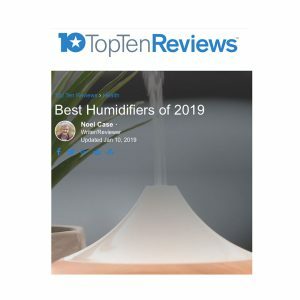 In the article, the author explains that they have been reviewing 23 humidifiers from 17 different manufacturers since 2012 to help consumers find the best one for them. As well as testing and trying the humidifiers themselves they talked with experts such as Michele Cassalia, Director of Marketing for the asthma & allergy friendly® Certification Program, and Karen Boren, a writer who has done extensive research on health and wellness. The Certified asthma & allergy friendly® humidifiers have been tested against ASL scientific standards and are scientifically proven to help contain and reduce exposure to asthma and allergy triggers. Measuring its ability to reduce pre-existing contamination in the room.